"I think President Lincoln would be very proud of me standing up here right now.”—Comedian Tok Moffat starts on a serious note, before joking about his South African roots. Beginning this August, President Lincoln’s Cottage and DC Improv are partnering to present Two Faces Comedy, the first comedy series performed at the National Trust Historic Site. The innovative series draws inspiration from Abraham Lincoln’s legendary humor and self-deprecation and seeks to expose audiences to the president's human side and to recognize the use of humor as a valuable tool during trying times. Below, Callie Hawkins, the site's associate director for programs, discusses the idea behind the series, and exposes some of the concepts that make it so compelling to fans of both history and comedy. Tell me more about the name of the series. What (or who) inspired it? It’s such a great example of Lincoln’s ability to laugh at himself, and it’s one of his jokes that really stands the test of time. So, rather than simply calling this program “comedy night” we wanted to mirror Lincoln’s comedic subtlety and insert his own sense of humor into the program. Plus, it keeps our team from having to come up with our own opening jokes. The work that President Lincoln did at the Cottage was often serious, especially in the midst of war. 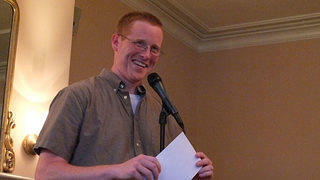 How does hosting a comedy series there today relate to the history and the mission of the site? Part of our mission is to introduce visitors to the “true Lincoln” and help them connect with him through his “untold stories.” Some of the people attending this program undoubtedly know about Lincoln’s appreciation for a good joke, or his use of humor as a way to diffuse uncomfortable or challenging situations. But at the same time, I’m sure many of the guests are coming for the comedy, not just the historical connection. So this program is a great way for us to remind our visitors about his humanity while also having them connect with an aspect of Lincoln’s personality and our country’s political history as they enjoy a good laugh. 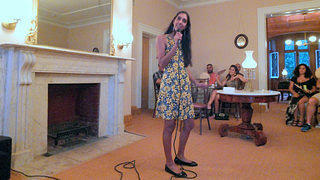 Comedian Kasha Patel fills Lincoln’s drawing room with laughs as she shares her perspective on the American immigrant experience. How are the comedians drawing inspiration from the site (if at all)? The seed for this idea was planted about a year and a half ago when Chris White, director of creative marketing at DC Improv, contacted our Executive Director and CEO, Erin Mast, about being part of a podcast on Lincoln’s Humor. It was important to us that the themes of each program connect to the site in some way but made it clear that the comedians didn’t need to specifically write jokes about Lincoln, or even history. I gave Chris some themes important to our site—slavery, race, immigration, politics, etc.—and he ran with it to recruit comics for the three-part series. What we landed on was an August show from comedians who are first generation Americans, and for whom their family’s immigration stories inform their sets, a second show with a local comedian who will perform a satirical take on American politics and the 2016 presidential election, and a third Whose Line Is it Anyway-style show that will bring out all these themes. We also invited all the comedians to take a tour of the Cottage—many of them already had—before their show so that they could get a sense of the place and why it was so important to President Lincoln. I’m excited to see how that will factor into their individual sets. 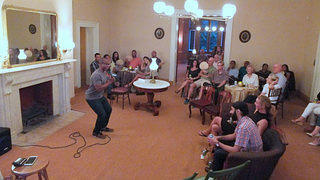 Chris White from the DC Improv—host of the first night of the Two Faces Comedy Series—warms up the crowd. We’re in the middle of an election year in the U.S., not to mention we're facing many tumultuous world events. How do you think the combination of comedy and Lincoln’s legacy can help us engage with current events? With a lot of what’s been happening around the world and in our own country, I think we’re all feeling a bit like “if we didn’t laugh, we’d cry.” That was a major reason we chose to do this now. This doesn’t mean that we’re making light of what’s happening. Instead, we’re using comedy in much the same ways as Lincoln did—as a diffuser during difficult times. We like laughing—it’s cathartic and healthy, healing even. When people come to see a show, what do you hope they’ll walk away saying? I actually hope people will walk away laughing—saying they had a fun night with friends and strangers, and that for an hour or so, they felt a little magic in knowing that over 150 years ago, this same month in this same place, Abraham Lincoln was probably doing the same thing, in the same room. I think there’s some comfort in realizing that as difficult as times were for Lincoln—as tumultuous and precarious a situation as our nation was during the Civil War—Lincoln made time to laugh with others, and we should, too. Remaining show times and details: September 7 and October 18; doors open at 7:00 p.m., show starts at 7:30 p.m.; tickets $5; cash bar with beer and wine, $5/drink.